Good Friday afternoon and extremely happy to be back home after spending three days in Silver Springs, Maryland, with two sitting in as the Advisory Panel proxy for Captain Bob Bogan (Gambler) on the HMS A.P. meeting....and what a two days it was to say the least. As Pat Augustine said to me a number of times, "the HMS A.P. is like no other advisory panel," and that is not an understatement in comparison to the others, especially in the dialogue and back and forth discussions between stakeholders and various HMS staff. For those who have no idea on what the HMS is, or manages, this is the Atlantic Highly Migratory Species within NOAA component which is comprised of tunas, sharks, swordfish, and billfish, with the primary emphasis on the first three. As much as we have great angst with many of our local and regional fisheries, the HMS issues are the most complex due to the international implications in not only managing allocations, but with the lack of enforcement, monitoring and reporting of catch/discards particularly by various nations offshore pelagic longline fleets. Here the economic and social impact is to the American commercial and recreational fishing industry that is severely constrained by regulations, and yet the foreign commercial fleets benefit in what is essentially unregulated harvesting, and the kicker then ending up with the shipping of these species back to the U.S. seafood markets. By far the finest speaker from the commercial industry in laying out these issues was Scott Taylor of Dayboat Seafood who not only speaks in a tone similar to actor James Earl Jones, but presents the most thoughtful arguments as well as dour sentiment on how the A.P. meetings "get little done to benefit the American fishermen and the fishing industry in this country." Essentially we are now in the catch avoidance industry instead of fish catching and retaining business. I should also note that Sam Rauch is now serving as the Acting Deputy Assistant Secretary stopped by for 45 minutes, and answered questions. 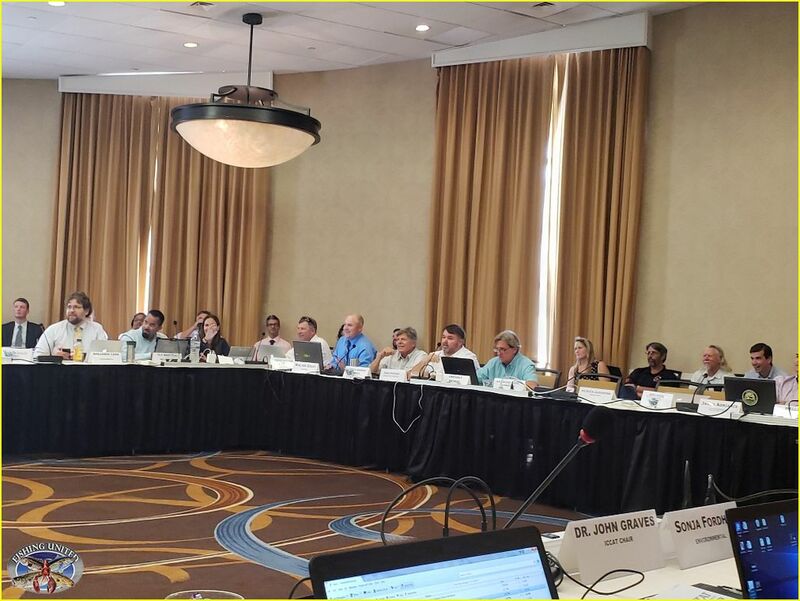 It is an understatement to say "he is as sharp and without any emotion as they come in answering questions as per the NOAA/NMFS handbook - period." 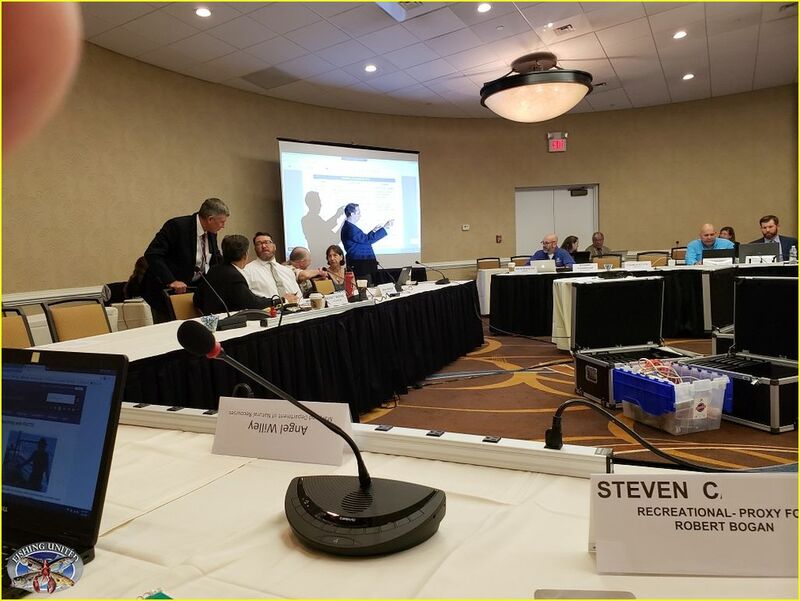 For me taking up a space at the big table, I did make the last comment put forward as the A.P. proxy on day one with the issue of "fillet at sea," only for inspected vessels (party boats) of YFT and LF, with rack retention and fillets to be held in clear plastic bags to make it easy for enforcement to check upon. I was fortunate that the Fishery Specialist Brad McHale gave a detailed answer at the end of a long first day on how this has been proposed originally by Captain Bob Bogan and was researched (research and calls made to how this is handle with the pacific fishing monitoring of species caught on for-hire vessels) as far as the implications of moving this proposal to a future motion....but at this time their is the continued enforcement I.D. issue of filleted tuna onboard ANY vessel, and this will have to be further studied to see if this can be allowed in the future. Interestingly enough, during the meeting after "social" of course with adult beverages in hand, Brad came over and gave me further back round as far as the attempt to have such a subtle measure move forward, and I do hope there is some justice done here as the full time northeast party boat industry from Cape May, New Jersey to southern Massachusetts, now has less than ten vessels involved in chasing tuna in and along this region's (NE and MAFMC) canyons. I also had Capt. 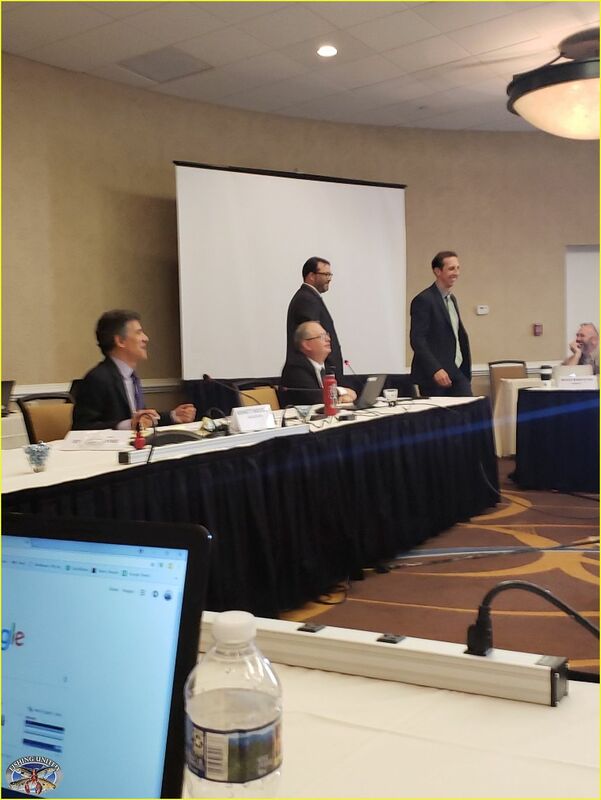 Michael Pierdinock (CPF Charters and RFA) come over later on and thank me for again bringing up an issue to benefit both the operators and customers in the for-industry, and the issue is not 'd.o.a.' yet as it was included in the day two summation of A.P. comments made. I have to thank Pat Augustine who gave me much guidance along the way, and of course knowing a few of the players who attend meetings does help. 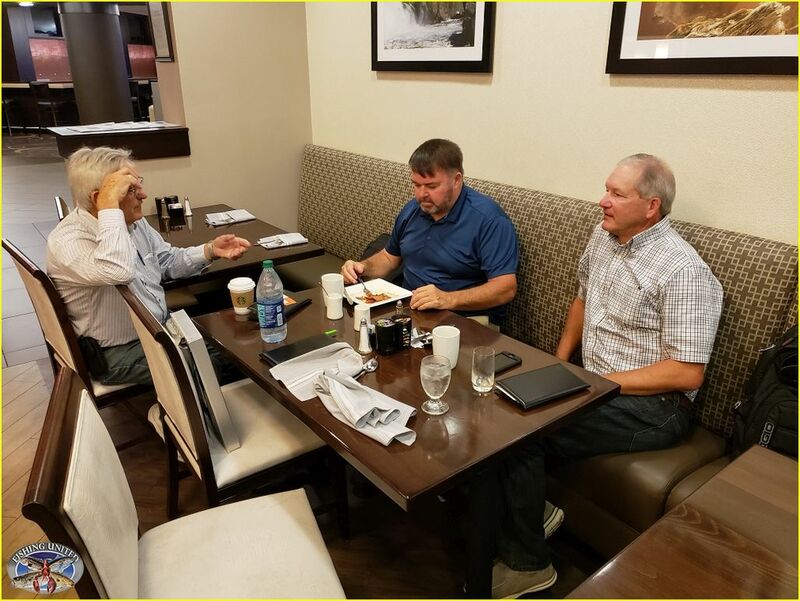 No doubt the breakfast buffet in the morning sitting with either Greg D. of the GSSA as well as Pat, Dewey H. and Rick B., had a good number of funny stories brought up which sets a cheerful tone before the seriousness of these fishery meetings. With Dewey and myself I always tell him "to take it easy on us with Black Sea Bass," and it is always brings a bunch of laughs on how we continue to slide down the regulatory drain pipe on this particular fishery. I do have to mention meeting up with Dr. Willie Goldsmith since we both know each other for something akin to two decades through the internet fishing forums and socialized media. Needless to say it was incredible learning experience to be sitting at the table, and I did happen to take advantage of the complimentary free use of the LA Fitness center around the corner from the hotel. That was interesting to say the least. Oh, I should also mention to strap in as far as the "not so good" news coming with Bigeye Tuna (one stakeholder called it a coming bloodbath), as well with the regulatory implications with the Shortfin Mako fishery (which for those who fish for mako's should full well know the new minimum size). 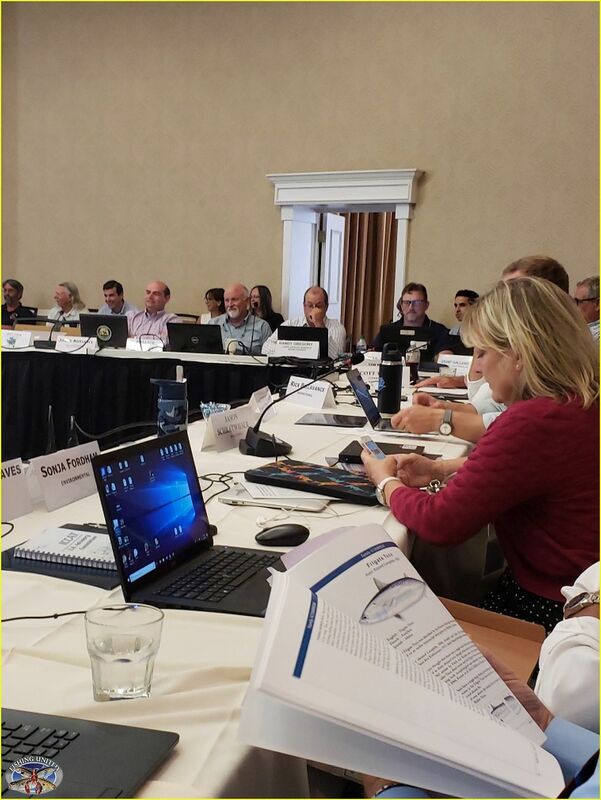 These discussions were pretty intense (as well as swordfish) as once again with all American fishermen are bearing the brunt of the conservation of these species to the economic benefit of other overseas fishing nations. It does make you make you wonder in dealing with ICCAT, but that is a whole other story in the protection of a valuable fishery resource as well as 'US' fishermen. I should finally mention for those out there who sell these species to make sure they are in full USCG safety compliance if you are engaged in the harvest and sale. it was brought up a few times about vessels with no USCG sticker and/or permits and stakeholders pushing forward with more severe crackdown while these vessels are on the water fishing. Brad the Fishery Specialist did make mention that the USCG is no longer just in the educating phase and they, the USCG will be issuing large monetary summonses to those who are not in compliance as well as in not following fishery regulations. Word to the wise here.